"Making the unknown known is the important thing." For Grace consulted on a special segment hosted by Maria Shriver on NBC’s Today show that spoke to gender bias in healthcare. Among many aspects of this troubling topic, our spokesperson pointed out the enormous bias toward women in pain that often gets in the way of optimal care. Besides describing her decades long experience of being told that her pain was all in her head, she spoke to the thousands of women who report similar complaints to For Grace. Here’s a LINK to this in-depth segment. For Grace takes Migraine seriously. So much so that we’ve launched an awareness campaign that includes an educational webpage chock-full of tools and resources for those who suffer. We’ll also be sharing and writing much about Migraine on social media and blogs. Learn more about this little understood, serious chronic pain condition that impacts one billion people worldwide! For Grace has signed on to a letter that encourages US Senator Todd Young (R – Indiana) to put forth legislation for the Center for Disease Control to collect epidemiological data on chronic pain including the incidence and prevalence of all conditions, syndromes, diseases, etc. The legislation proposes to create a National Chronic Pain Surveillance System and allow researchers and federal agencies to use the data collected. Pleased to share two interviews For Grace leaders recently gave in Amsterdam while working with a Global Patient Advocacy Dialogue Group. This group aims to improve health and pain care for people around the world. Cynthia Toussaint’s interview speaks to the pain patient experience – and John Garrett’s focuses on the carer’s perspective. For Grace is proud to support the efforts of leaders in science, politics, healthcare and academia to recognize January 25th as Women’s Health Research Day. Senator Tammy Duckworth and Representative Jan Schakowsky are planning to introduce a congressional resolution to acknowledge this important awareness effort. For Grace will contribute actions that include signing onto a letter endorsing the day, sharing announcements of the day via social media and, most importantly, joining a coalition of organizations interested in empowering women to be a part of medical research. California Senator Hannah-Beth Jackson is again teaming with For Grace to author a resolution that will proclaim September 2018 as Pain Awareness Month. The resolution will also observe a day (TBA) in September as Women In Pain Awareness Day. It’s a great pleasure to work with Senator Jackson and her amazing staff, most notably Bethany Renfree and Fernando Rameriz. We send out our deepest gratitude. Cynthia Toussaint travels to London this week to represent the USA in a global CRPS focus group. These meetings aim to give pain management industry a thorough understanding of the CRPS patient experience with a keen eye on similarities and differences around the world. For Grace is proud to be a part of this effort, one that will ultimately improve the lives of all who suffer with this potentially devastating disease. November is Caregiver Awareness Month in the US! To honor this, For Grace Director John Garrett is sharing his considerable carer insight and perspectives throughout the month on the Pain Matters Facebook page. John is the primary caregiver to his partner, Cynthia, who has been challenged by pain and fatigue conditions for 35 years. As such, he has a deep appreciation for what it takes to care for someone in pain along with much wisdom about how to love and sustain through the toughest of times. For Grace founder Cynthia Toussaint doesn’t like it when others get in the way of pain care. In a recent Pain News Network article, she supports a boycott of CVS and their new policy to restrict opioid prescriptions. Cynthia also takes issue with other pain advocacy organizations as For Grace stands alone in this action that defends pain patients. Link here to read this provocative piece. For Grace leaders were in Amsterdam on September 25-26 to participate in an ongoing Global Patient Advocacy discussion. The last discussion led to our founder Cynthia Toussaint presenting chronic pain at the World Health Organization’s General Assembly in May in Geneva. Many constructive discussions were had that will accelerate a better tomorrow for people in pain. For Grace has joined 73 organizations in writing a letter to the President’s Commission on Combating Drug Addiction and the Opioid Crisis. The letter highlights the need to implement the National Pain Strategy as part of a long-term strategy to address the chronic pain and opioid epidemics, as well as the critical care needs of people with pain. For Grace Founder Cynthia Toussaint was invited to join a dozen thought-leaders to brainstorm how women process severe physical and emotional pain. This two-day think tank took place in Philadelphia on January 17-18th. The conclusions from these workshops will ultimately help women who suffer from migraines. The Los Angeles Times ran an informative article that takes a close look at the Super Bowl OIC ad that For Grace partnered on. Find out more about the controversy surrounding the ad seen by 115 million people by linking here. Also, Forbes.com wrote a positive, in-depth article about the spot and why OIC is different from normal constipation. For Grace Spokesperson Cynthia Toussaint will speak at the American Pain Society’s 2015 annual four-day meeting. After a screening of the Discovery Channel’sPain Matters, she’ll panel with two others featured in this groundbreaking film. The event will also launch PainMatters.com that Ms.Toussaint will guest blog on. A powerful, in-depth piece about For Grace leaders’ 32-year experience with chronic pain and caregiving is running on Lifescript.com. “How a Hamstring Tear Derailed a Dancer’s Life” focuses on how CRPS can upend a person’s life as well as those around them. 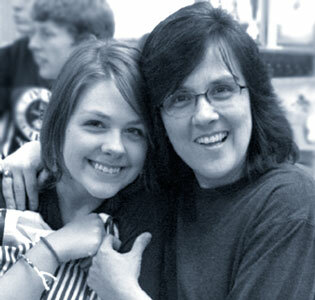 Recently For Grace leaders served as spokespersons for an internet media tour in Atlanta. Besides sharing their 32-year chronic pain and caregiver experience, they started a conversation about a common side effect of taking opioids for the treatment of chronic pain: opioid-induced constipation, also known as OIC. Link here to see one of the interviews and please visit this new blog dedicated to OIC. For Grace Spokesperson Cynthia Toussaint was a featured speaker at this prestigious event that spotlighted cutting-edge research about pain and its management. Ms. Toussaint shared her 32-year chronic pain experience, advocacy work and impressions about the research presented at this hope-generating symposium. View Day Two of the worldwide webcast here. For Grace was the proud recipient of this year’s Albert R. Rodriguez Civic Legacy Award. This honor was presented by LA-based Community Partners, a highly-regarded fiscal sponsor to over 150 nonprofit projects that provide essential services to local and worldwide communities. Groundbreaking Chronic Pain Documentary Premieres on The Discovery Channel – Now Available Online! 2013 WIP Conference Generates Much Media Attention! Excited this year’s event again garnered media buzz. Features and interviews included PainResource.com, KPFK radio, PainPathways magazine, NBC radio KCAA,pre- and post-event articles on the National Pain Report and HealthCentral.com. Another year of great coverage and awareness raising! Women In Pain CD Released! ABC News Covers For Grace’s 2012 Women In Pain Conference! For Grace’s annual conference was spotlighted in an ABCNews.com article on Sept. 13th. Titled “Annual Women In Pain Conference Focuses on Relationships“, the piece sheds light on caregiving and chronic pain. For Grace is proud to have generated, consulted and interviewed for many media stories around this empowering event. We celebrate 10 years of providing aid, comfort, education and empowerment to those challenged by chronic pain – an amazing journey that leaves us grateful and humble for the opportunity to serve such a resilient community. As we move forward, let’s collectively pledge to take every action possible to achieve a better world – so that one day all of our current trials and tribulations will be but a memory. This is our dream of never again… For those we have served – and will serve – we send our love. For all those who have helped us along the way, we send boundless grace and gratitude. For Grace and Diane Sawyer Team Up! For Grace inspired, consulted and interviewed for an ABC World News with Diane Sawyer segment that focused on women being disbelieved and under-treated for their pain conditions. 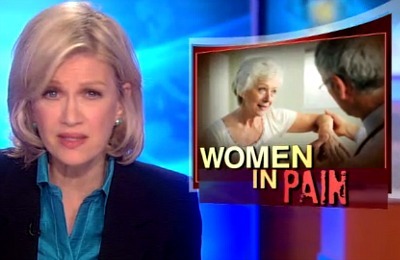 Headlined “Women In Pain“, this piece will be picked up by all ABC affiliates in the US. Honored to announce that For Grace Spokesperson Cynthia Toussaint was nominated by Jane Goodall for the Los Angeles County Commission for Women’s 27th Annual Woman of the Year Award. Women nominated for this prestigious award must exhibit outstanding leadership for women’s rights, promote women’s equality and be exemplary role models. Spiced with celebrities, laughter and live performance, For Grace hosted its 3rd Annual Women In Pain Conference at the California Endowment’s Center for Healthy Communities. This year’s theme was “Raising the Curtain on Pain” and focused on Integrative Medicine and Creative Art Therapies. Please link here to see a webcast archive of the event! For Grace co-hosted a second innovative conference. Our theme was “Diversity: No Woman In Pain Left Behind” and it was staged at the California Science Center in September to co-incide with National Pain Awareness Month. We had upwards of 500 attendees and the event was webcast live worldwide! Please link here for details about the conference, including media coverage and a webcast archive. For Grace encourages women in pain to access a great advocacy resource, “In the Face of Pain”, to bring to your community awareness of the pain gender divide through media, legislation and civic groups. WIP—take action and be heard today! View Our WIP Public Service Announcement! This 30 second spot, titled “Unsung Heroes“, features actor Jack Coleman, star of NBC’s hit drama, “Heroes”. In the PSA, Jack delivers our message about the pain gender divide to the world! For Grace partnered with Southern California Cancer Pain Initiative and City of Hope to hold the first annual Women In Pain conference. We assembled a world-class roster of speakers/presenters, along with performers/artists, who educated and inspired women in pain and their health care providers. For Grace co-hosted the 1st Annual CME Women In Pain Conference: Gender Matters which was held at City of Hope in Duarte, CA. Please link here for details. • CA State Senator Sheila Kuehl has proclaimed May 30, 2008 “Women In Pain Awareness Day” in California. There was an announcement on the Senate floor. • LA County Supervisor Zev Yaroslavsky did the same in LA County. There was an announcement at a supervisor’s meeting. • LA City Councilmember Wendy Greuel did the same in LA City. Greuel and Toussaint made a presentation at LA City Hall. This was broadcast citywide via LA CityView 35. From the genesis of For Grace founder Cynthia Toussaint’s California WIP hearing and awareness month resolution, a coalition of pain advocacy leaders has formed to model this effort across the nation. To celebrate RSD awareness month in California, For Grace rolls out its newest project, “Share Your Story,” which features compelling stories from across the country and beyond. For Grace was excited to launch our RSD National Awareness Campaign (NAC) to bring much needed RSD attention to communities across the country. The talents and passions of those with RSD, along with their families and friends, provide the catalyst for this sweeping initiative. NAC will ultimately promote early diagnosis and treatment, bring hope and community to those suffering in silence and trail blaze a new, better RSD world. To develop an important tool for our RSD clients, For Grace has forwarded a letter of introduction along with RSD education materials to over 100 pain clinics/centers throughout the state. This is phase one of our project to compile a comprehensive database of RSD treatment providers in California and to educate these providers about our work. For Grace Founder Cynthia Toussaint authored a petition addressing the current medical gender bias that women experience with pain management in this country. She continues to circulate this important statement among pain communities and women’s groups and is receiving signatures of support daily from around the world.